Mohamed Salah has raced to the top of the Premier League scoring charts having evolved his game this season in a new tactical role. Salah currently has 19 goals and seven assists to his name in all competitions and has been a driving influence throughout Liverpool’s blistering league campaign—despite a subdued start to the season. 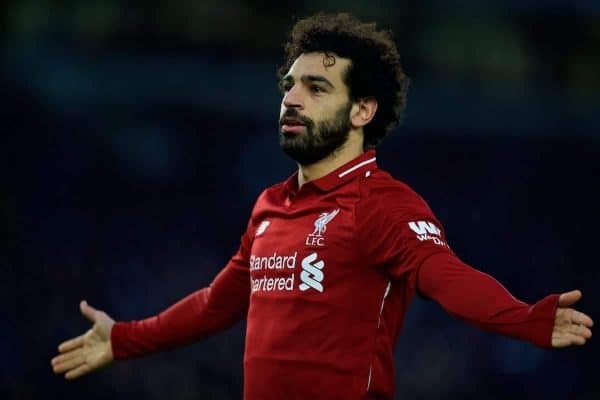 While his current tally is five goals short of his total at this stage last season, the Egyptian has developed his all-round game to become a more consistently influential figure during matches. In fact, he frequently involves himself in all aspects of Liverpool’s attacking play, while still delivering goals at a prolific rate. Salah very much remains a talismanic figure, but the nature of the performances he is regularly producing now are notably different in several aspects from those of last season, largely because of a tactical change to his role in the side. After a record-breaking debut season at the club, it would take a bold manager to shift a player who scored 44 goals cutting in from the right flank into a new position the following campaign. That, though, is precisely what Jurgen Klopp did with Salah, and there were in fact already signs of Salah moving to a more central role towards the back end of 2017-18. 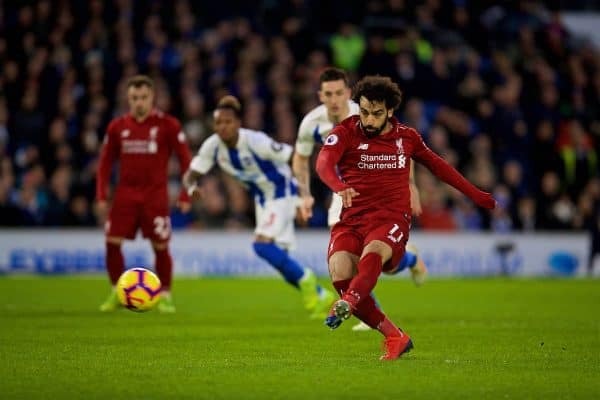 He started up front in a 4-2-3-1 formation, as he broke the Premier League record for the most goals in a 38-game season, on the final day against Brighton. 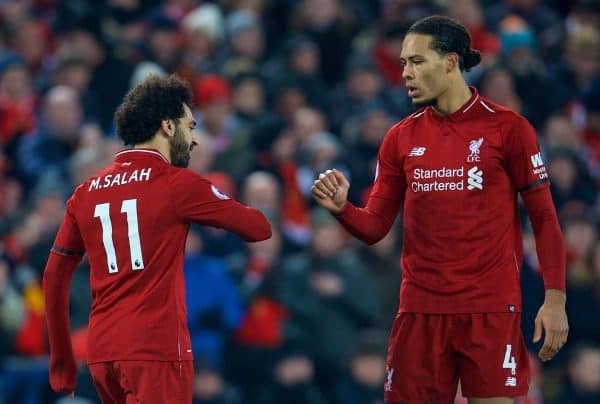 There was a sense that opposition sides were beginning to find ways to stop Salah getting on the ball and to limit the spaces in which he could operate from that inside-right berth—but as Klopp has repeatedly shown throughout his tenure, he is extremely adaptable and always looking for new solutions to keep progressing. At first, however, the positional switch looked far from natural for Salah. He endured a frustrating start to the season, scoring just three goals in Liverpool’s first 11 games, while the knock-on effect saw Roberto Firmino also struggling to find form as he grappled with his new, deeper No. 10 role. 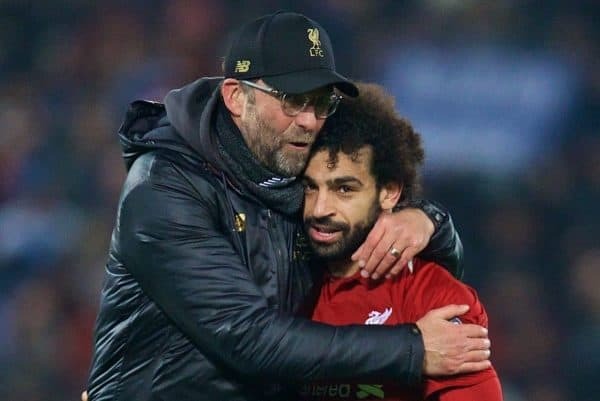 Klopp also alluded to the Egyptian adding more components to his game, suggesting: “Of course he’s still young enough to involve a lot more things in his style of play. There were other mitigating factors affecting Salah’s underwhelming start to the season, particularly relating to ongoing problems with his shoulder following the injury he sustained in the Champions League final in May. 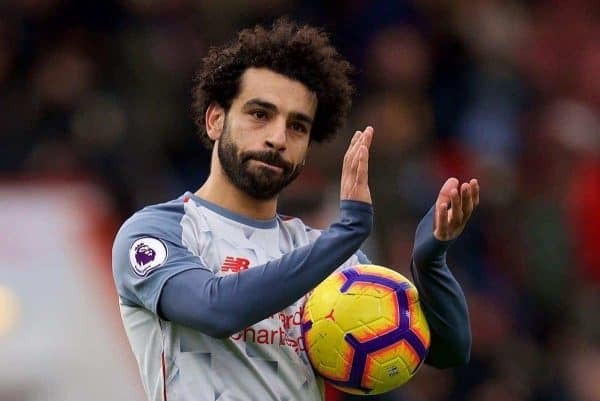 Salah looked visibly weak at times during the opening period of the season, a player not fully confident in his own body and perhaps avoiding physical situations in order to prevent aggravating the problem. This, combined with his need to adapt to his new tactical role—and perhaps the pressure and expectations that come with scoring 44 goals in a debut season—saw Salah frequently cut an exasperated figure, clearly unhappy with his inability to reach the levels he proved himself to be capable of. Those concerns have long since been dismissed, however, as he has impressively grown into the role as the season has progressed—with Firmino similarly starting to flourish in his own deeper position. As the above heat maps show, Salah’s action zones are not drastically different compared to last season, although now he tends to drift out wide from an ostensibly central starting position, rather than moving in-from-out. This gives opposition teams a different problem to think about, in terms of how they set up to stop him. The fact that he has scored 31 per cent of his league goals this season from inside the six-yard box (versus 12.5 per cent last season) is also an indicator that he has become more adept at taking up classic ‘No.9’ poaching positions closer to goal on a more regular basis, while scoring fewer spectacular solo goals. What the heat maps also show, through the intensity of his actions in the dark red patches, is that Salah is more heavily involved in games this season than last. While remaining a serial goalscorer, his influence outside the box has become increasingly instrumental. Salah may have built his reputation at Liverpool as a ruthless goal machine, but the most impressive aspect of his evolution this season has been his significantly improved creative output. 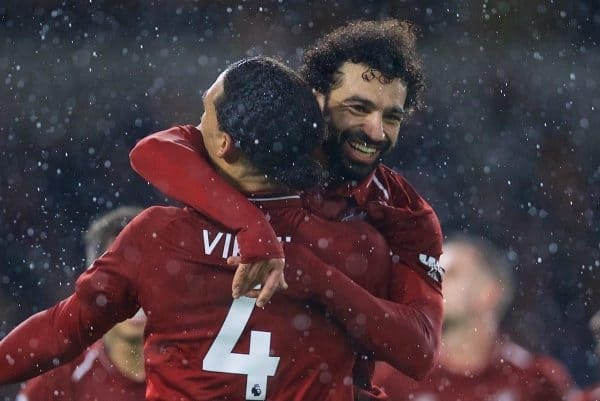 Adding new facets to his game, such as dropping deep to link play and kick-start attacking moves from central midfield zones, Salah has shown a propensity to take on the responsibility to conduct Liverpool’s forward play from unorthodox positions in a manner he wasn’t doing last year. 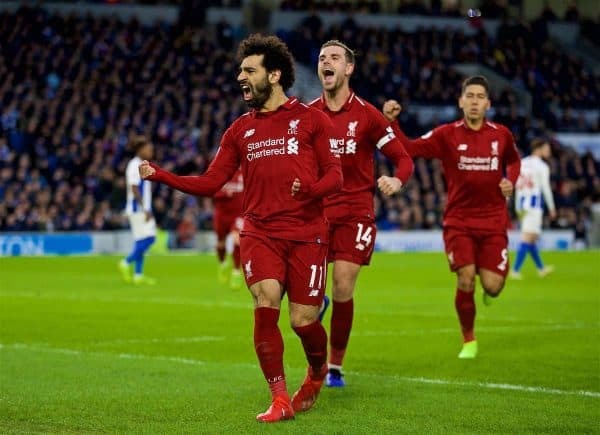 His second-half display against Brighton, for instance, when Liverpool had struggled to create any openings of note throughout the first half, saw Salah take the game by the scruff of the neck and begin to demand the ball around the centre circle. Driving aggressively at opposition players and playing sharp, incisive, vertical passes, Salah began to create spaces which hadn’t existed before. Ultimately, it was his tight control and dribbling in the box which earned the penalty—which he duly dispatched to seal a crucial three points on the day. As the table below illustrates through several key metric comparisons, Salah’s increased creativity has been a notable by-product of his evolution this season. Salah’s 13 big chances created is the second-most of any Premier League player, bettered only by Ryan Fraser (17), and is five more than Liverpool’s second big-chance creator, Andy Robertson (eight), with Firmino and Sadio Mane on four apiece. Again, Salah’s successful through-ball rate has doubled since last season, with his 11 accurate attempts currently the seventh-highest of any Premier League player. In the whole of last season, he managed just eight successful through balls, which saw him not even in the top 30 players in the league on that particular metric. While his speed, finishing and positioning are regularly highlighted as his key attributes, these numbers demonstrate the extent to which Salah’s vision and passing technique are underappreciated…but increasingly prominent features of his ever-expanding skill set. Notably, Salah has also already equalled the number of successful tackles (12) he made from the entirety of 2017-18 this season, suggesting that he has also upped his game in terms of his work off the ball in winning possession high up the pitch. This is still key, of course, for Klopp’s tactical blueprint, even if pressing is not always feasible against many of Liverpool’s opponents who tend to have very little possession. Matching last season’s exceptional tally was always going to be a near-impossible task for Salah this season. But the context surrounding his 19 strikes so far this term shows just how decisive his contributions have been, in terms of defining how matches have played out. 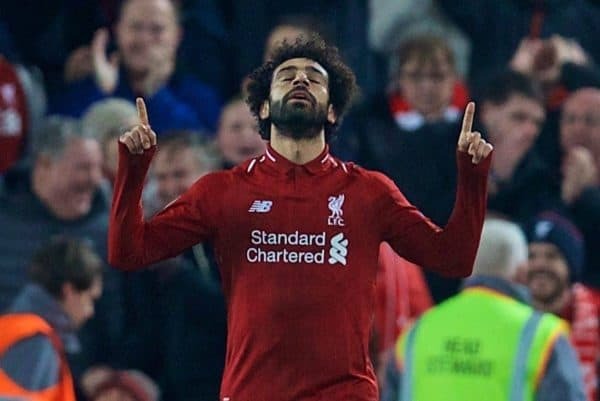 On 10 separate occasions, Salah has opened the scoring for Liverpool in 18/19 and on four occasions Liverpool have won 1-0 with Salah being the only scorer: Brighton home and away, Huddersfield away, Napoli at home. He is proving the difference-maker in tight encounters, where the team as a whole have not been quite at their best from an attacking perspective. His superbly taken goal against Napoli, in fact, proved the difference—along with Alisson’s stoppage-time save—between Liverpool crashing out into the Europa League and now facing the tantalising prospect of a last-16 tie with Bayern Munich. Again, in the chaotic encounter with Crystal Palace at Anfield, it was Salah who put Liverpool back on terms by showing terrific anticipation and technique on the equaliser—a much harder finish than he made it look—and who put the Reds 3-2 up following Palace’s own equaliser. 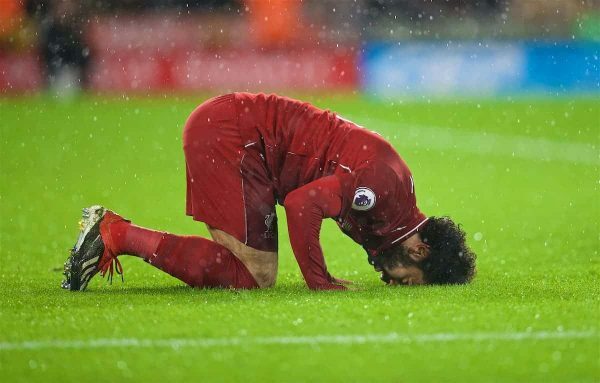 Somewhat under the radar is the fact that Salah has also successfully converted all four penalties he has taken this season, again showing his composure and confidence to step up and take on the responsibility in such high-pressure situations. As the records continue to tumble, with 63 goals to his name a little over 18 months after arriving at Liverpool, Salah has shown a determination to elevate his all-round game to another level, rather than bask in the satisfaction of his personal achievements from last season. He has evolved into a more complete and influential attacker. Salah has coupled an increased creative spark with his untouchable ruthlessness in front of goal, operating as the spearhead of Klopp’s attack in his own niche, and slightly unorthodox, interpretation of the No.9 position. There should be no mistaking the fact that Salah has developed into a truly world-class centre-forward.